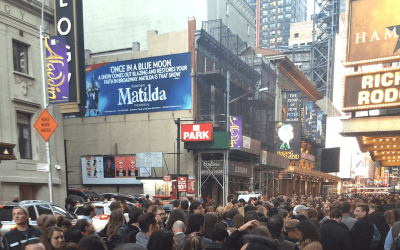 Judging from the success of Miranda’s two musicals, the 2008 Tony award-winning In the Heights and now the box office smash Hamilton currently at the Richard Rodgers Theatre, more theatergoers are inspired today than they have been for quite some time. 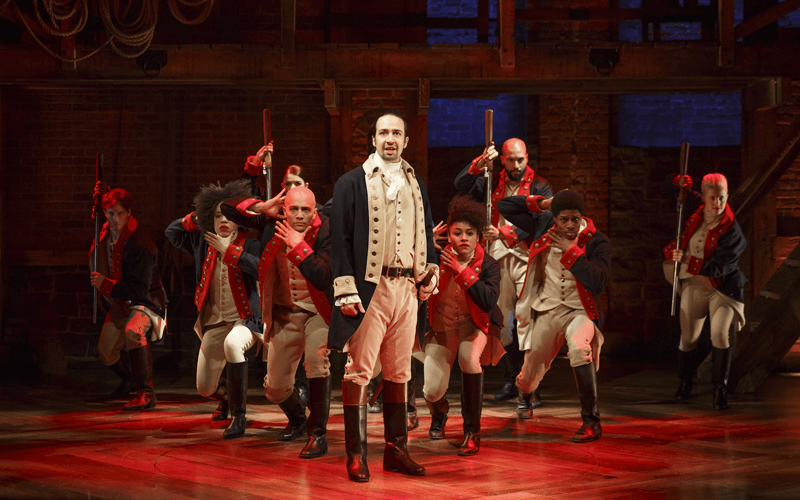 Hamilton is about the life of Alexander Hamilton, America’s first Secretary of the Treasury. 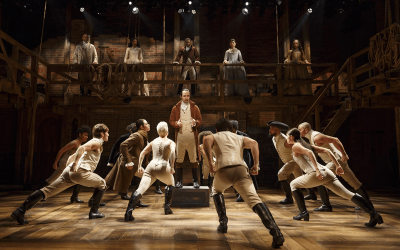 The musical, unlike a lifeless American history classroom lesson, is mostly delivered through rap over hip-hop beats, offering a fresh perspective to the importance of one of America’s most impactful pioneers. It’s smartly written, relevant and enjoys a multi-racial cast who discuss the issues of the day in freestyle rap battles backed by pulsing beats and rhymes. Leslie Odom, Jr., an unambiguously brown-skinned brother plays Vice President Aaron Burr. Chris Jackson, who starred in the other hip-hop musical, Holler If Ya Hear Me, last year takes on the role of founding father George Washington. 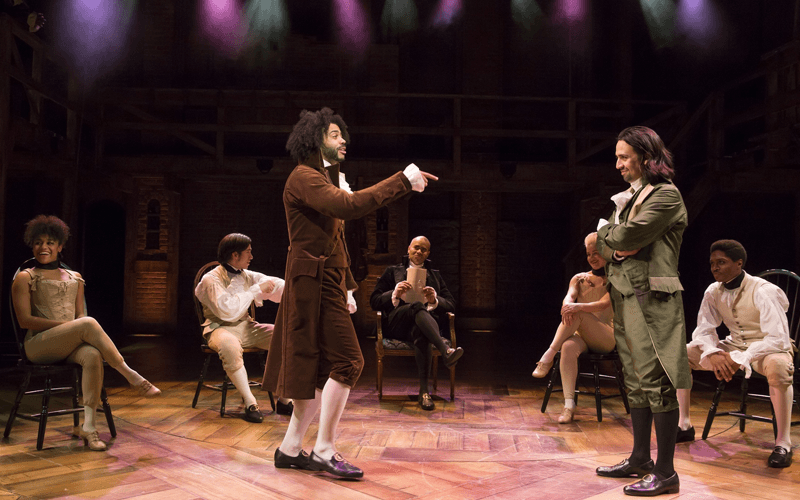 And Thomas Jefferson comes to life through Daveed Diggs, an actual hip-hop lyricist and theater-arts graduate from Brown University. The show has been sold out for weeks. Stub Hub tickets are going for as high as two thousand bucks. Even “rush lottery,” the way savvy Broadway theatergoers get their show seats, has a daily line that flows west of the Richard Rodgers, wrapping down Eighth Avenue bringing hysteria and excitement for the hundreds taking a chance at only 20 $10 tickets (coincidentally the bill with Hamilton’s face on it). The excitement sometimes gets so thick that cast members go Ham4Ham (H.A.M. 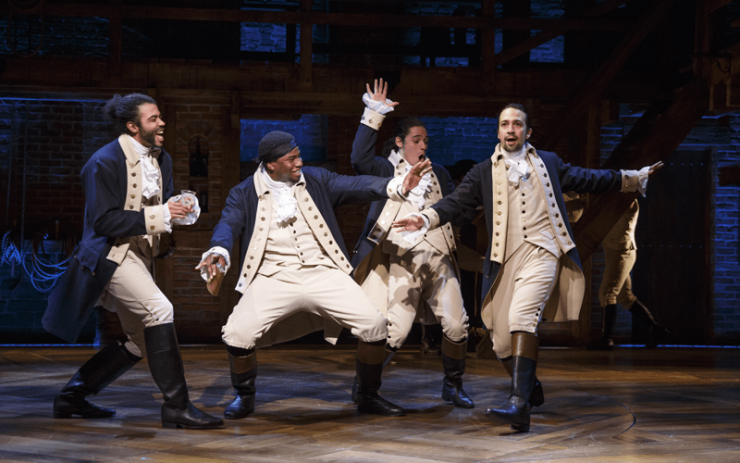 for Hamilton) and treat lottery hopefuls to impromptu performances, like that time the three actors who’ve been in the role of King George got together to lip-synch the song “The Schuyler Sisters” on the steps of the theatre itself. Oprah Winfrey has seen Hamilton, the Carters (Bey and Jay) have been in the house, Meryl Streep has seen it, and President Barack Obama has witnessed the greatness. Twice. 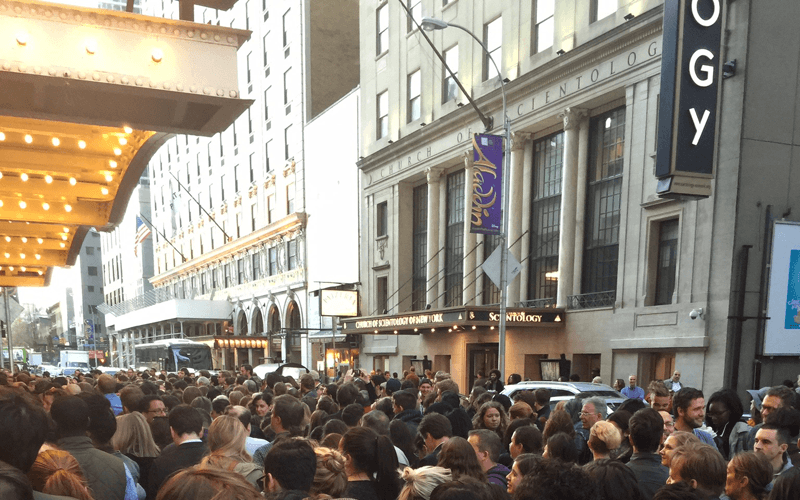 It’s literally Broadway’s hottest and hardest-to-get ticket. 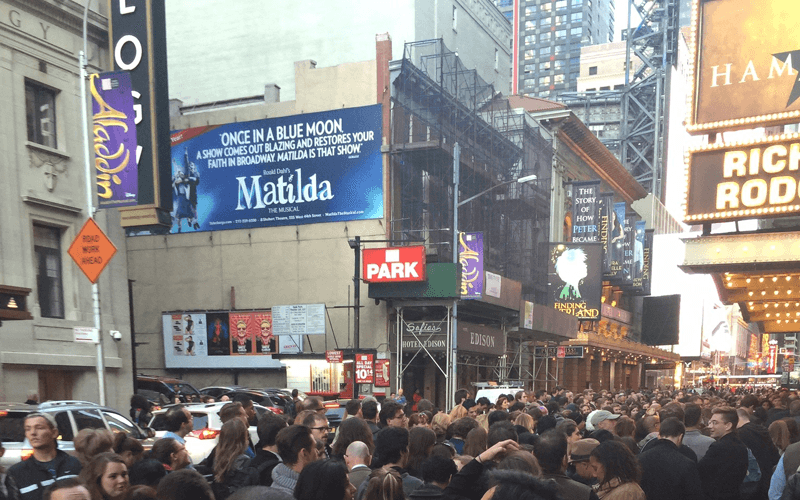 But if you can’t get a ticket, the next best thing is the original Broadway cast recording. Snag it at Amazon.com. 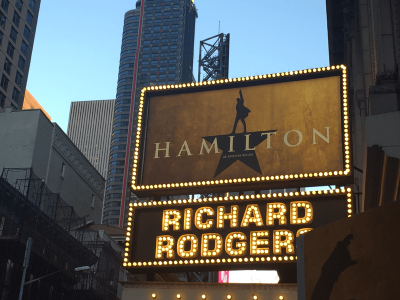 Incidentally, Miranda told Charlie Rose of 60 Minutes that he “didn’t grow up going to see Broadway shows,” because his parents couldn’t afford the cost of tickets (Hamilton’s top ticket cost is $475). Instead they purchased cast albums for the young Miranda. He said he consumed them. And pretty soon he was creating them. Miranda’s first Broadway show, In the Heights, won the 2008 Tony award for best original score. That accolade seems apropos for the young Puerto Rican from New York City who got all of his early Broadway exposure from vinyl. In fact, Miranda’s musical won four Tony awards and a year later, he brought home the Grammy Award for best musical theater album. In 2013, the wünderkind added another rung to his quest for an EGOT, winning an Emmy award for Bigger!, the fantastic “over the top” opening number from the 2013 Tony awards. 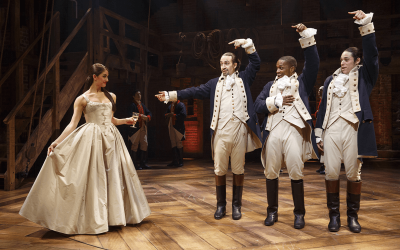 The world first got a glimpse of the idea for Hamilton in the spring of 2009 when the White House invited Miranda to do a spoken word performance. 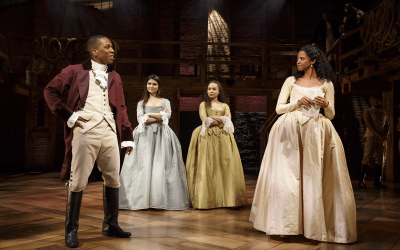 At that time Miranda shared with the audience, inclusive of President, First Lady Obama and their two beautiful girls, that he was working on a hip-hop concept album about America’s first Secretary of the Treasury. In one of those, “man, c’mon!” moments, the audience chuckled en masse. Fortunately for the world, Miranda was not joking. It all started after he read Ron Chernow’s biography on Hamilton. Miranda noticed a kind of poetry in Hamilton’s way of communicating. Sort of like the spit-fire cadences used by today’s rappers. 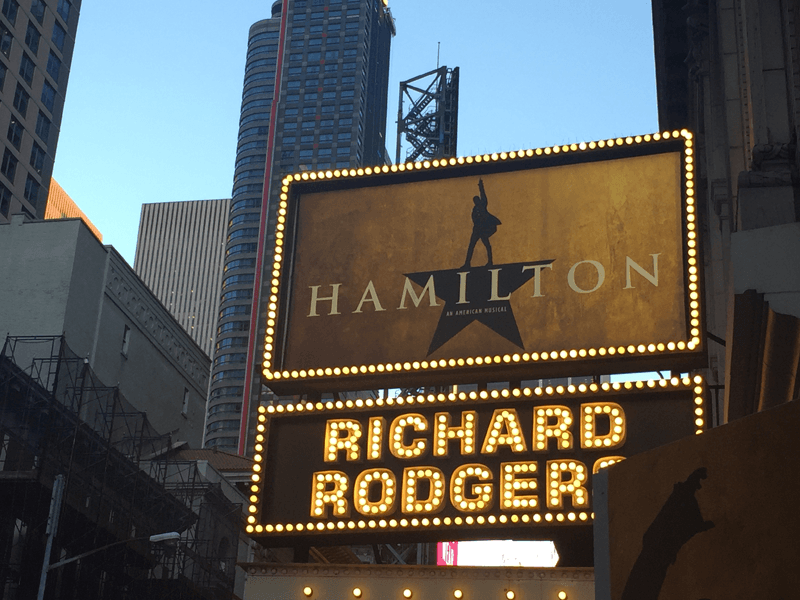 That evolved from a concept album to the “Hamilton mix-tape,” to a beautiful and flawlessly executed cast album. 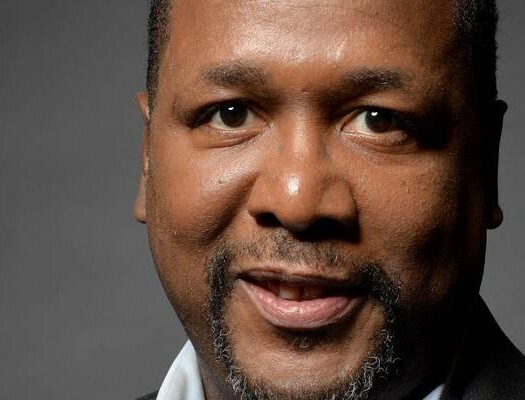 Having grown up in upper Manhattan and being a child of the hip-hop generation, Miranda used his extensive knowledge of the genre with his musical theater training to create a masterpiece. Popular hip-hop does manifest itself in the show, for instance – in “The Ten Duel Commandments,” Miranda gives a nod to the Notorious B.I.G.’s “Ten Crack Commandments”. He spits “Number six! 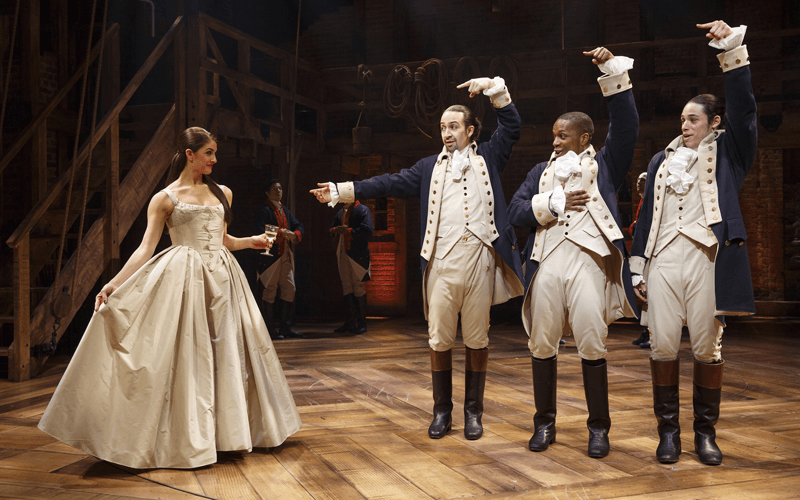 / leave a note for your next of kin / tell ‘em where you been / pray that hell or heaven lets you in.” In Act II on the song “The Adams Administration,” Miranda calls out (in classic hip-hop style) the other musical about the founding fathers, 1776. The musical is alive with internal rhymes, couplets, Faulknerian sentences and sly word play. 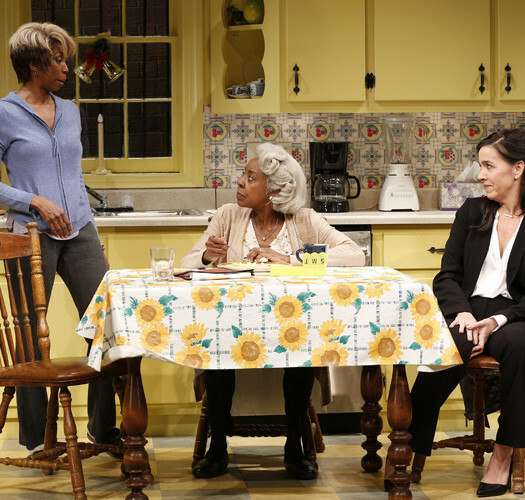 The music of this theatrical masterpiece is not so much heard as it is felt. With the advent of Hamilton, we see history and theater aficionados wanting to know more about hip-hop, hip-hop heads wanting to know more about history and musical theater, and everyone needing to know more about Alexander Hamilton.